Laws for Smoking in a Car - Lanes Insurance Inc. In 2014, Alberta banned smoking in a car when anyone aged 17 and younger is present. In section 3.1 of the Tobacco and Smoking Reduction Act it states, “no person shall smoke in a vehicle in which a minor is present.” The reasons are myriad, but the main one is to reduce exposure of minors to secondhand smoke. Minors do not have the choice to exit the vehicle when an adult begins to smoke, and secondhand smoke is especially dangerous for children. It contains more than 7,000 chemicals, at least 70 of which are known to cause cancer. According to tobaccofreeca.com, children breathe in more air than adults due to the fact that their lungs are still developing. Because of this, the health risks due to secondhand smoke for children are more extreme. 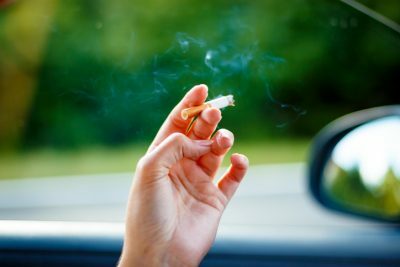 Tobaccofreeca.com’s article “Smoking In Cars Is Toxic” states that after only half a cigarette has been smoked in a car, the air quality in the vehicle reaches levels 10 times more than what the United States Environmental Protection Agency considers hazardous. Kids exposed to secondhand smoke are more prone to middle-ear infections. Secondhand smoke is known to aggravate asthma symptoms, and can even cause asthma in children. Those younger than six who are exposed to secondhand smoke are susceptible to severe respiratory tract infections, such as bronchitis and pneumonia. Currently, Alberta has no provincial law prohibiting the use of e-cigarettes, however several municipalities have restricted their use in public places, such as Calgary, Edmonton, Cold Lake, and Red Deer. The penalty for smoking and driving with a minor in the vehicle in Alberta is a hefty fine of $1,000. The ticket will not result in demerit points, however the amount of the fine should be a deterrent. Plus, refraining from smoking in a car with a minor present is simply the right thing to do. Is Smoking and Driving Dangerous? Many believe smoking in a car to be the same as distracted driving, which is said to cause at least one in 10 accidents. Simply finding a pack of cigarettes, locating a lighter and then lighting the cigarette takes the focus off the road for a significant period of time. Distractions are visual (while looking around inside the vehicle drivers are not as aware of their surroundings), cognitive (the mind is focused more on the cigarette than the road), and manual (drivers do not have two hands on the wheel, which is always recommended). The United States’ National Institutes of Health has published a report studying the impact of smoking while driving, and found that smoking causes more distractions than even cell phone use. Smokers spent an average of 12 seconds being distracted by lighting their cigarette, while cell phone users averaged 10.6 seconds of distraction. Although legal in Canada now, cannabis can’t be within reach of anyone in your vehicle when you are driving, so the safest place for it is in your trunk. It must also be in secured, closed packaging. All drivers suspected of being criminally impaired through taking cannabis and driving will face an immediate 90-day suspension of their licence and an instant three-day seizure of their vehicle. They will also be required to take part in a one-year ignition interlock program as well as mandatory remedial education. Levels of impairment are measured by blood-to-drug concentration limits. More than two and less than five nanograms of THC per millilitre of blood is a summary charge that carries a maximum federal criminal penalty of up to a $1,000 fine. Five nanograms of THC per millilitre of blood and above is an indictable offence that, if convicted, will result in a minimum $1,000 fine for a first offense, a mandatory 30 days imprisonment for a second offense and mandatory 120 days in jail for a third offense. One of the best reasons to choose Lane’s Insurance for your auto insurance is that we offer some of the best insurance support in the Canadian insurance industry. You can always count on the brokers at Lane’s to provide you with all the information you need about your coverage and to be there for you should you ever have to file a claim. If you have any questions about auto insurance, contact us at our Calgary, Edmonton, Banff, or Alberta offices.